An interest for tracing family history has become a very popular pastime. With the help of the internet, working on your genealogy is easier than ever. By creating an informative family history book you will have a keepsake record that can be treasured. To start recording family heritage information – you can download the template that is available on this page for free. The template is simple to customize and it is 23 pages in length. It includes a cover for the book, a table of contents, and more. It will become an important family history book to have and share. Compatible with Microsoft Word 2003 or later. Download the template to your computer and save to any folder of your choice or direct to the desktop for quicker access to the file. Locate the file and open it to start customizing the areas you want. The first page is the cover of the book. You can change the images and replace it with your own if desired. There is also a text block which you can delete or write a brief description about the book. The page of contents has a detailed list of the pages you will be completing including an introduction page from the author. Write a message here that you would like others to read. Other pages that can be customized include parents, grandparents, great-grandparents, siblings, and more. You can add pictures of family members too. 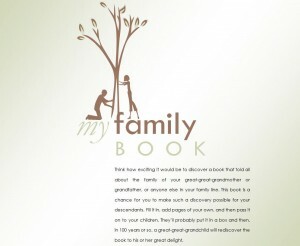 The family history book is easy to use and customize so you can change the font style and colors. Additional pages can be added at any time including images. Once completed you can save the file for future editing if necessary. You can print out a current copy to share with your family. You can also convert it to PDF and share it online. The family history book template is a fun way to create an important document about your family heritage – which can be passed down to your children. Download it today for free and begin your adventure.